Bluffing is at the heart of any game of poker, providing most of the interesting aspects of play. 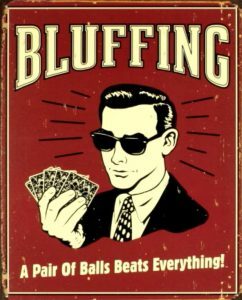 The art of bluffing in essence is the skills of convincing your opponent you have much stronger cards than you really do, making them give up the best hand, this gives a real thrill factor and not much beats the rush of taking the pot when you’re sure you had the worst of it. Learning the timing of when and who to bluff is crucial if you want to be a successful poker player. Without an element of bluffing poker would be a very stale game indeed, with each player waiting for the best hand to pick up the pot the game would have much less appeal. The fact that you can win any round you play, even if you haven’t made the hand you were hoping for is what makes poker so exciting. By mixing up your strategy you can remain unpredictable, with opponents on the back foot not sure of where they stand in a hand they will often fold in the face of uncertainty. You will not only pick up pots through bluffing but it can also help you win larger pots when you do have a great hand (especially if you have been called down and forced to show a bluff recently). However the flip side of this is that when bluffing you are taking a risk, and if not used sparingly can lead you into big trouble. There any many factors to take into account when deciding whether to make a bluff, it is not wise just to move in a big stack of chips and hope then strength you are showing will force the other players to fold. You also need to consider your opponent, the board cards, the stack sizes, your table image, and how the hand was played so far. New players to the game over value their hands as they have little frame of reference to decide how strong a position they are in, if a player is going to chase every draw and call with any pair, this is not someone who you should try and push off a pot and instead you should remain solid and wait until you have the upper hand. If there is action pre-flop a board with high cards like A-K-10 is likely to have hit some of your opponents or they could have big draws, this is not the time to try and pick up the pot either. Also consider if the player you are up against is committed to the pot, if he has invested say $20 on the previous streets he is unlikely to fold to say a $4 bluff if that is all he has left in play even if the last card was not a good card for his hand. The ratio of the bluffs you make to bluffs that go though unchallenged will depend largely on your table image, if you are only having to show solid pot winning hands at the showdown (or any other time you chose to show voluntarily to enhance you image) then you will probably be credited with another strong hand, however if you have had to reveal your bluffs after being called down then the other players will be looking to spot when you have your hand in the cookie jar again and will call with marginal hands. Always consider you table image and think about the story you have created about your hand with your bets, if you have checked at every opportunity throughout the hand can you really expect your opponents to believe you have hit big on the river just because you have made one sizeable bet on the end? This is just a brief insight into the first levels of thinking in regard to bluffing, as with most things in life and poker you will learn by doing. You will be best advised to carefully consider what you are doing before you put your own money at stake on a huge bluff, however the truth is if you are not getting caught bluffing every now and again then you are probably not bluffing enough! If you want to see the bluff in action check out this video, by one of the greatest poker players in the world Phil Ivey just like a shark you better not let Ivey smell fear, with the confidence to trust fully his own read on players, he is happy to put you to the test with any two cards in his own hand.